The NYS DEC regulates activities on or near the New York City shoreline, including tidal and freshwater wetland areas. Fees are required for Tidal Wetlands and Freshwater Wetlands permits. You don’t need to know in advance all of the permits you need from the NYS DEC. They’ll determine that for you, based on the project information you provide. If you need more than one permit for your project, they may package the permits together and track them all under one core permit. Contact the DEC by phone or email for answers to your questions on small scale projects. If you are dredging, have a difficult site, or a complex project, you can request an up-front discussion or a pre-application meeting for permit guidance. The DEC can discuss your project with you and determine whether or not a pre-application meeting is needed. Wetlands boundaries are often not well defined. A NYS DEC specialist may need to review your project and determine the wetland boundary and whether the project location and scope is within DEC jurisdiction. Development restrictions may apply. Find out in advance you can or cannot do in the different types of wetland areas by checking what regulations apply to your planned activity. Project sites that are found to have illegal structures or land improvements (for example, a building or development constructed without a permit and not grandfathered under NYS DEC policy) may be subject to legal action. Violations may be resolved as a part of the permitting process at DEC’s discretion. You must mail hard copies of the DEC’s Waterfront Activities Application Checklist (DEC to provide link); all required documents and drawings, as indicated on the checklist below; and one (1) digital copy (files in pdf format on a CD) of the entire submission to: Regional Permit Administrator, NYS DEC Region 2, 47-40 21st Street, Long Island City, NY 11101-5407. The NYS DEC requests that fees be submitted with applications. After they receive your permit application, the NYS DEC staff reviews your submission for completeness (all documents and drawings are included and contain the required information) and compliance (how the project conforms to development regulation and restrictions for the proposed activity). The DEC may then send you a Notice of Incomplete Application (NOIA) requesting you re-submit your application if it is deemed incomplete or if they need more information. The NOIA may include project design modifications requested by the DEC to avoid, minimize, or mitigate any impacts to the wetland habitat and/or to conform to wetland development restrictions. Once an application is determined to be complete, DEC must notify applicants within certain timeframes about a determination. These timeframes are regulated by the Uniform Procedure Act. Major* Projects – with public hearings Public hearing must be held within 90 days. Final decision within 60 days after receiving a final hearing record. Most projects have a permit duration of up to five years, but may be renewed, modified, and extended up to 10 years. Maintenance dredging projects have a permit duration of 10 years. Requests to renew, modify, or transfer a permit must be in writing to NYS DEC office in Long Island City. If you have an existing permit and wish to transfer it to someone else, you need to complete an Application for Permit Transfer form. The Application for Permit Transfer requires certification by both the proposed new owner/operator and the present permittee. Please allow 30 days for processing. Tidal Wetlands permits are required for a range of activities on tidal wetlands and their adjacent areas. Tidal wetlands are wetlands where tidal flooding occurs on a daily, monthly, or intermittent basis. For the purposes of NYS DEC permitting, tidal wetlands include the coastal shoreline as well as marshes, flats, shoals, bars, and all lands under tidal waters up to a depth of six feet at Mean Low Water (MLW). These areas are delineated on the New York State Tidal Wetland Inventory. In New York City, a tidal wetland adjacent area may include any land area up to and within 150 feet from the tidal wetland boundary. Certain existing site conditions may limit the exact extent of the adjacent area. Tidal Wetlands Permit Program – Is this Project Major or Minor? Generally, a minimum setback of 30 feet from the landward edge of any tidal wetland is required for all principal buildings and all other structures in excess of 100 square feet in NYC (exceptions apply). The minimum setback of sewage disposal systems is 100 feet landward from the tidal wetland line. Sewage disposal systems shall have a two (2) foot minimal clearance from seasonal high ground water and other impermeable materials. Not more than 20 percent of the adjacent area within a property shall be covered by existing and new structures and other impervious (non-porous) surfaces (exceptions apply). Minimum lot areas are stipulated for any building constructed within the regulated area. Clustering of residential buildings is permitted to encourage the maintenance of undeveloped areas in or adjoining tidal wetland areas. The minimum setback in NYC of all impervious (non-porous) surfaces such as driveways, roads, and parking lots is 30 feet from the tidal wetland line. Substantial increases in surface water runoff to selected tidal waters shall be prevented through the use of control measures such as dry wells, retention basins, filters, open swales, or ponds. The NYS DEC Freshwater Wetlands Permit Program regulates a wide range of projects, work, and activities that occur in freshwater wetlands and their adjacent areas. Lands and submerged lands that may have water visible for only part of the year, such as marshes, swamps, sloughs, bogs, and flats. They support aquatic or semi-aquatic vegetation and are valuable resources for flood control, surface and ground water protection, and wildlife habitat. Land or water areas that are outside the wetland, but within 100 feet of the wetland border (exceptions apply) that provide a valuable buffer to the wetland itself. The DEC’s Freshwater Wetland Permit Program is limited to freshwater wetlands that appear on the New York State Fisheries Maps, and are at least 12.4 acres in size, or are designated as Unusual Local Importance (ULI) wetlands. Excavation and Placement of Fill in Navigable Waters – Excavating or placing fill in any navigable waters of New York State, including ponds, lakes, rivers, and navigable streams with a classification and standard of C or D.
In addition to the water body or watercourse itself, adjacent and contiguous wetlands are also subject to permitting. However, a permit is not required for navigable waters that are totally surrounded by land held in a single private ownership. Docks and Moorings – Applies to dock and mooring structures on or above the navigable waters of the state (exceptions apply). Excavation and Placement of Fill in Navigable Waters – Direct or indirect placement or excavation of fill in navigable waters of the state that are inundated at mean high water or mean high tide. NPFAs protect natural habitats, infrastructure, structures, and human life from wind and water erosion, along with storm-induced high water. Human activities, such as the development or modification of beaches, dunes, or bluffs, may decrease or completely remove the erosion buffering function of natural protective features. These are lands located landward of natural protective feature areas and have shoreline receding at a long-term average annual recession rate of one foot or more per year. 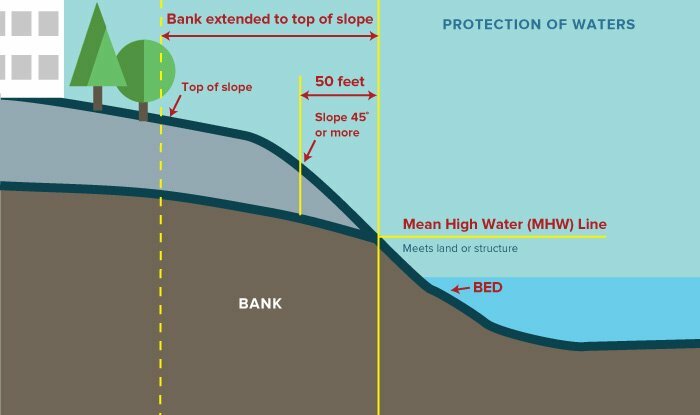 Development within structural hazard areas is limited by regulation to reduce the risk to people and property from coastal erosion and flood damage. 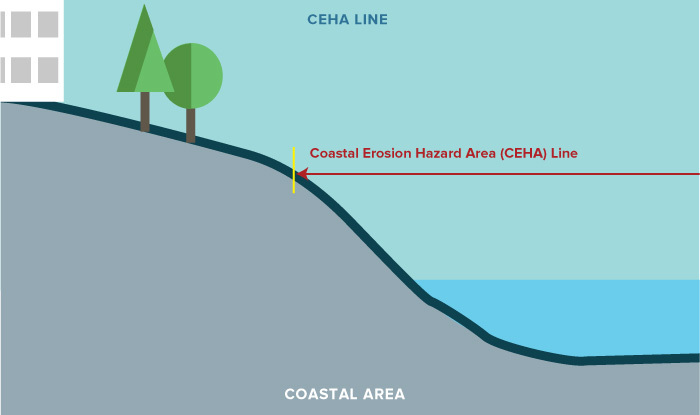 Due to the nature of the water’s edge, CEHA areas are constantly changing. Currently, CEHA areas exist in the following boroughs of New York City. Placing fill or undertaking activities resulting in a discharge to what the Army Corps refers to as Waters of the United States and where a permit is required from the Army Corps under Section 404 of the Clean Water Act.